A widely accepted symbol of status and love, diamonds are very valuable and highly tradeable. While they can’t compare with oil or machinery imports, worldwide diamond imports totaled $117.4B in the last year. That’s big business. We wanted to know how big, so we created this visualization to show you where all the diamonds are going. As with most industries, the top players command a huge majority of the wealth. The world’s top 15 diamond importers represent over 96% of global imports. Among top 15 importers, there are no countries from Oceania or South America. Australia appears #18 and Brazil at #52, with $7.6M, or just 0.01%, of the world’s diamond imports. The 34 countries from the bottom of the list import less than $1.5M totals. Some of these countries import so few diamonds that the entire value may be the result of purchases made by a private individual. Nigeria, for instance, had total diamond imports of just $1,000. Many other countries in Africa, South and Central Americas, and central Asia also have fewer than $100,000 in diamond imports. Most understand diamonds this way: poor countries, like those in Western Africa, mine diamonds and rich countries, like the U.S. and the U.K., buy them. This narrative became especially popular in the 1990s and early 2000s, as a result of journalism covering blood diamonds. In reality, the market is more complex than that. Countries don’t exclusively buy or sell diamonds. Several (the U.S., India, and China, for instance) are importing and exporting diamonds in huge quantities. The reason for this often has to do with quality and preference. For instance, a rich country may export cheap diamonds and import expensive ones. The worldwide total for diamond imports in 2016 was $117.4B, but we checked the export total that same year and discovered that it was $127.6B. So what happened to the other ten billion? According to the IMF, “The principal reasons for inconsistent statistics on destination and origin for a given shipment are differences in 1) classification concepts and detail, 2) time of recording, 3) valuation, and 4) coverage, as well as 5) processing errors.” Turns out that $10B is just the cost of doing business in the diamond industry. 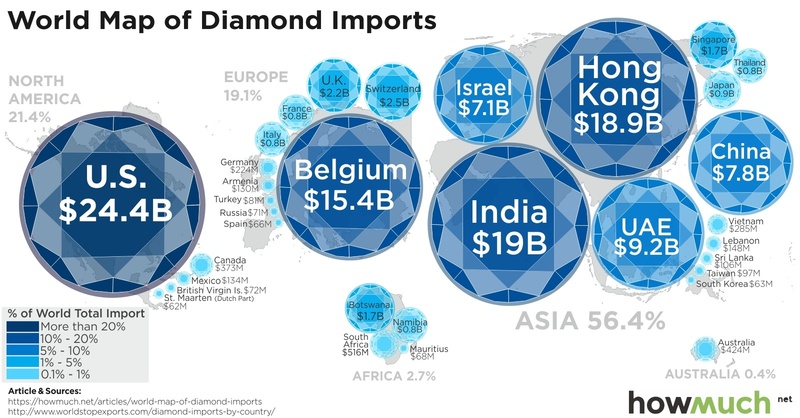 Someone without awareness of nation-by-nation economic trends might be surprised to know where the diamond import markets are growing and shrinking. Namibia, Singapore, and Italy – three nations on different continents with wildly different cultures – represent the three fastest growing markets. Namibia and Singapore each skyrocketed, growing over 100%. The U.K., the U.A.E., Botswana, and even Belgium (the world’s historic diamond capital) all represent shrinking markets. But why? In the U.K., diamond imports dropped nearly 75% since 2012. Part of this drop in demand could be a result of the trend toward other gemstones in bridal jewelry. In other places, like Dubai (the diamond bazaar of U.A.E. ), may just be on the back end of a boom. The diamond industry has a history of success based in cheap labor, high demand, tightly monitored supply, and incredible marketing. Although the artificial diamonds and market forces are changing the industry, there’s no reason to think that diamonds are going anywhere. In fact, a new supply of valuable ocean diamonds will begin hitting the market in the next few years, and may cause a new “wave” of diamond imports.